Are you looking for a new replica watch? 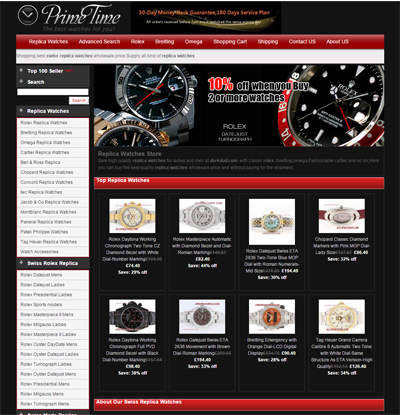 Then are you are surely on the searching for a new and terrific fake watches store with great quality products, excellent services and fair prices. Am I right? I have just discovered a new replica website and I am curious to see how reputable it is. Join me on this review to find out! The first thing I have noticed about Nwgraphics.co.uk is that it tries to be professional looking and appealing, but it does not do such a great job. The homepage is black and red; it has a simple promotional banner, short and simple menus and a couple of featured items. But the poor quality of the graphics and low visibility of the information shows us that it is just another common replica watches store. I was surprised to see that the collection is divided into “Replica Watches”(these are Japanese automatic movement knockoffs), “Swiss Rolex Replicas”, “Swiss Made Replicas” and “Standard Luxury”(also Japanese movement). The first category focuses on the most important brands while the last one includes many watch companies, some more famous than others. I like the fact that the store is so well organized, but it is a known fact that no company can sell countless different brands and offer the same quality for all of them. Some, like Rolex, are better than others. Of course, the more popular a brand is the better quality those replicas are. The products are easy to browse even though there isn’t an Advanced Search option and this is because these fakes are organized by the popularity of their brand and by their movement type. Concerning the prices, these are displayed in GBP. The Japanese automatic movement replica watches cost about 70-100 GBP while the Swiss mechanism fakes cost 200-300 GBP. These are not very expensive, but manage to respect the average price available on the market for this type of products. Unfortunately the imitation watches do not have good pictures. Each fake timepiece features only one image. No additional photos are available so we can view the products from different angles and determine how accurate they really are. Also, the pictures seem to be copied from different catalogs as some have a white background and a lower clarity while others have a dark background and a higher resolution. The description page isn’t that good either. The text is a little bit incoherent and not very detailed. The only available payment method is Visa. NwGraphics.co.uk does not provide any other alternative payment option. My opinion is that all online stores should accept at least three of the most used and secure payment methods, such as Bank Wire, Western Union and Money Gram. A company that takes only card payment just does not inspire that much trust. There is only one available shipping option and this costs 8 GBP. The company delivers packages all around the world and the shipping charge is the same for all destination countries. I find this strange as normally the delivery fee is influenced by the country and the weight of the package. Also, the website does not mention the company used to deliver the order. It just says that they use various shipping companies and that the estimated delivery time is 3-5 business days. NwGraphics.co.uk offers a 14 days refund and exchange policy and a 180 days free repairs policy. The returned replica watches must be in brand new conditions and the customer must pay for all the shipping back costs. Also, a fake timepiece can be exchanged or replaced only if it is faulty, but not if you simply do not like it. Returns are subject to a 10-40 GBP restocking fee and the repairs warranty covers only manufacturing defects. The company does not have an actual customer service, at least not a professional one. It has just a contact form. There is no other way to contact the store, like the usual email address, phone number or live chat. I don’t know about you, but I sure miss the good old replica websites that knew a thing or two about communicating with their customers. After all, this is the key to a good business relationship. Nwgraphics.co.uk manages to get our attention with low prices, a wide collection of both Swiss and Japanese replica watches, low cost worldwide delivery and 180 free repairs warranty. But on the other hand it has a couple of worrying aspects, such as unreliable product photos, unprofessional customer service, it accepts only Visa payments and it features a very unfair return policy.